Prayer desk carved before 1916 St Jame's Church, Newtown . Who was Nellie Payne? Prayer desk St Jame’s Newtown. 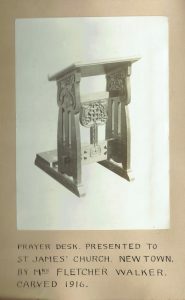 A new church was built in Newtown and a dedication service for the church and everything in it, including a prayer desk carved by Nellie, was held in September 1916.